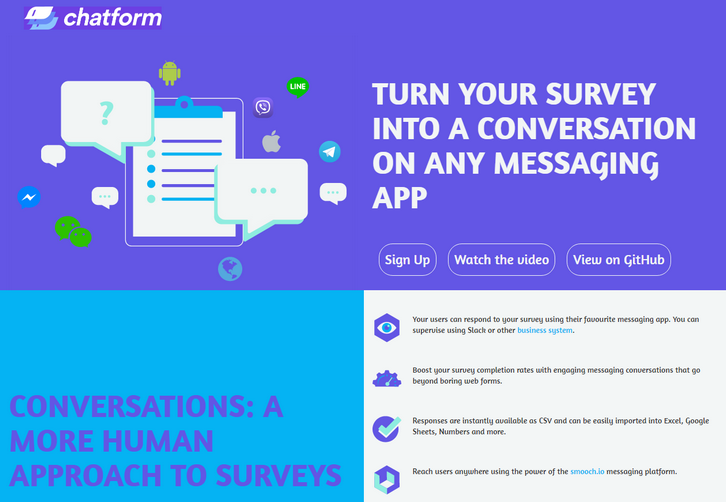 Chatform let you turn your survey into a conversation on any messaging app. You can create surveys or forms and gather responses using: Facebook Messenger, WeChat, Twilio SMS, LINE Messenger, Telegram, Viber, Twitter DM, Web Chat, e-mail, and in-app chat on iOS and Android. Download responses to your forms and surveys as a CSV file: easily import these responses into Microsoft Excel, Google Sheets, Numbers and loads of other software. Best of all, it’s open source (MIT license) so you can modify and improve chatform and make it even more awesome. What Can Be Better Than Monstroid Multi-Purpose WP Theme? Maybe Monstroid 2? Preorder It With a Huge Discount Right Now! This article will be interesting to all Monstroid fans, all curious nerds who want to be the first and know about all innovations and inventions taking place in web design and development field, and just to thrifty entrepreneurs who never pass by a lucrative bargain. 2016 was a special year for TemplateMonster.com. The guys improved their products considerably, so now they match even higher quality standards. The team made deeper niche analysis, totally overhauled Cherry Framework, developed their own WordPress plugins, and switched to the GPL license. Monstroid 2 can be called a result of all these as well as other positive changes. This product combines the best practices of company work and makes an outstanding start for 2017. TemplateMonster gives you a brilliant opportunity to try out this multi-purpose WordPress theme before the official release. Pre-order it for a reduced price now, and they’ll send Monstroid 2 alpha version right to your mailbox. Want to pre-order Monstroid 2 right now? Click here. To view its live demo follow this link. No doubt online stores are forcing out the ordinary shops out of business. However the abundance of the former on the web makes the competition extremely tough. So deciding to launch your online store you should take into consideration lots of details to make it more appealing for the customers than the stores of your competitors. If you think that the most important thing is sleek catchy design, you are wrong. It is important, but far not paramount. The main thing for your website to be popular is to be customer-oriented and user-friendly. If it takes hours to find the item needed or the buying process takes too many steps, or your store looks broken when browsing through mobile devices no one will pay attention to your cool animations, parallax scrolling or trendy design. You should always think of your customer. If you focus on selling your product you will gain nothing. If you think of what your customers want, they will feel it and appreciate it. There are lots of eCommerce templates to choose from: Magento, OpenCart, responsive PrestaShop themes, WooCommerce, etc. Each of them has its own peculiarities, but all of them are user-friendly and easy to work with. For this roundup we have hand-picked 20 bestselling eCommerce templates of this winter, which are excellent examples of client-oriented websites. All of them are provided by one of the world’s leading template providers, TemplateMonster. This is not just a brand. This is a guarantee of professional approach in everything up to the tiniest detail. The themes are extremely feature-rich, making it easy to create a user-friendly and fully functional website. Sleek up-to-date design corresponds with all latest tendencies and trends. Being highly flexible each of the themes can be adjusted to your needs and goals. StoreFlex is a successful solution for any eCommerce project. Its stunning design is supported by powerful functionality creating a perfect combination for any website. The template goes with clipart for 20 product types, which enables you to use 10 different topics in one pack. StoreFlex is extremely flexible. Use intuitive layout builder, experiment with varied skins and color schemes to give your website a unique look. Full RTL support and multi-currency makes it easy to expand your business to international market. Lookbook presentation, promo banner, deal of the day, smart product filtering and other features make the template extremely functional and user-friendly. As a freelance web designer, you no doubt enjoy working to your own schedules. And not having to commute to work, or a boss that likes micromanaging are also good perks. You work hard to improve your skills, and to keep up with the latest trends. As a result, you have little difficulty in finding clients and good, well-paying assignments. It’s not uncommon for freelancers to take on so much work that, as far as their ability to deliver high-quality work on time, time after time, the wheels start to come off. If you’ve fallen into the trap of working longer hours, but you are still missing deadlines, and even losing a client or two on occasion, read on. There are ways to quickly resolve your situation. There’s only one person capable of improving your productivity; that person is you. Wasting hours installing WordPress themes? Solution: use a better tool; working with this popular theme takes only minutes. Wasting time working with difficult clients? Solution: There are plenty of easy to work with clients out there. Not prioritizing tasks? Solution: Brush up on your time management skills. There’s no doubt that the Q4 holiday shopping season is the busiest time of year for online store owners and ecommerce businesses. If your freelance business or agency works with these online merchants, the last few weeks have almost certainly been hectic and stressful. Performing last minute site updates, troubleshooting broken add-ons to the merchant’s ecommerce platform and resolving bugs are all common occurrences. Maybe you were even woken in the middle of the night because a client’s site was hacked or you had to resolve a hosting error that knocked your client’s site offline. It can be enough to make you want to pull your hair out and quit the business altogether. 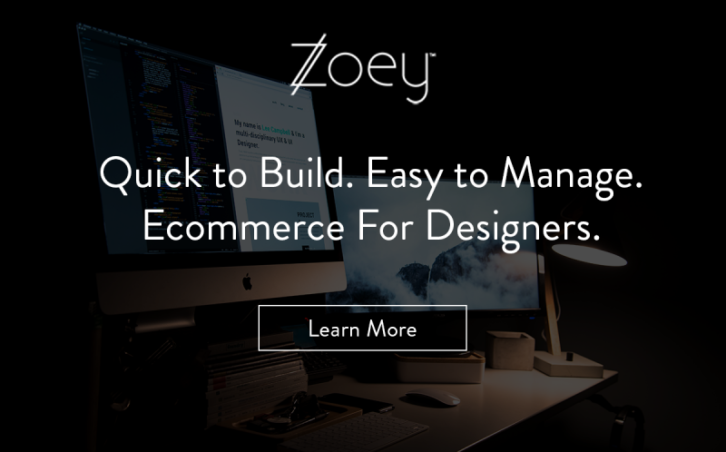 Zoey is the first ecommerce platform built specifically to empower designers, freelancers and agencies to create stunning and powerful ecommerce sites, easily manage multiple client sites at once and never stress about hosting or store security again. Agencies and freelancers that are already building on Zoey have found that they can launch sites 4x faster than on other platforms, at one-third of the cost. This allows them to work on more sites at once without scaling their team and win business from clients with smaller budgets. You can get started with Zoey for free and learn more about earning your $500 here. Zarget, a full-service CRO tool, helps marketers drive email subscribers, guide users through the funnel, and get to know their website visitors. 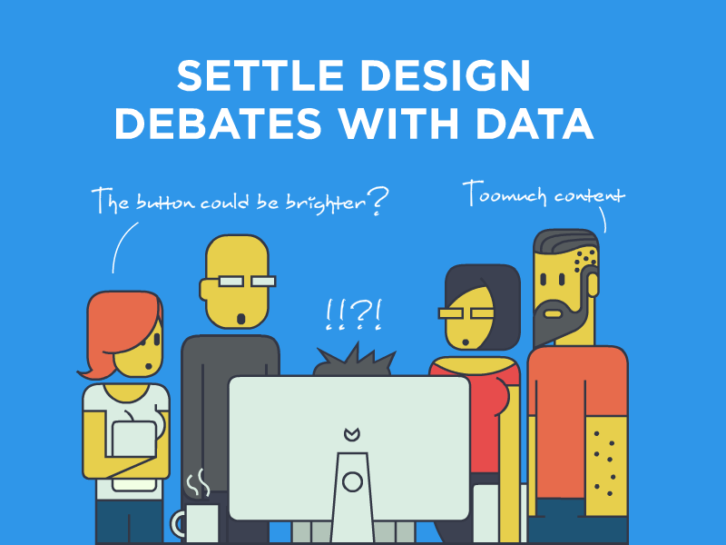 Using hard data can help you make vital decision about your website. The point of every website is to bring in conversions, and the point of conversion optimization is to plug leaks in conversions. Strong optimization requires the use of different tools for different needs in order to bolster conversions, and oddly enough, that’s where traditional conversion optimization is lacking. Traffic on a website can lose direction easily. A potential buyer can get distracted right before checkout if they have the option for coupons. If you showcase available offers instead and make them choose, it is more likely to yield in conversions. Another hurdle is intercepting users who wander aimlessly and get them on the path you intend. Funnel Analysis will help steer your traffic down the right path. Zarget believes that conversion optimization should be as streamlined and intuitive as the results it promises. To that end, they offer multiple optimization modules in one software product, with full integration between them. Track drop-off points with metrics like hesitation time, refocus points, and corrections made. Reducing the complexity of your signup form helps boost user signups — and eventually your business. Smart design choices are no longer based on experienced assumptions. Boost your website conversion rates by letting CRO data decide your design elements. Try Zarget now! Cloudinary is well known for solving the challenges you face when managing images and videos. With its newest enhancement, the company is also eliminating the complexities of media delivery by enabling the use of multiple content delivery networks (CDNs) to ensure end users quickly and reliably receive content. Today, images account for more than 60 percent of downloaded content. Cloudinary enables you to optimize this content, ensuring great performance for your site. But image optimization is only one part of the equation. You also need to ensure efficient delivery of media, which is measured by availability, latency and throughput. CDNs move content closer to end users, helping to improve delivery. 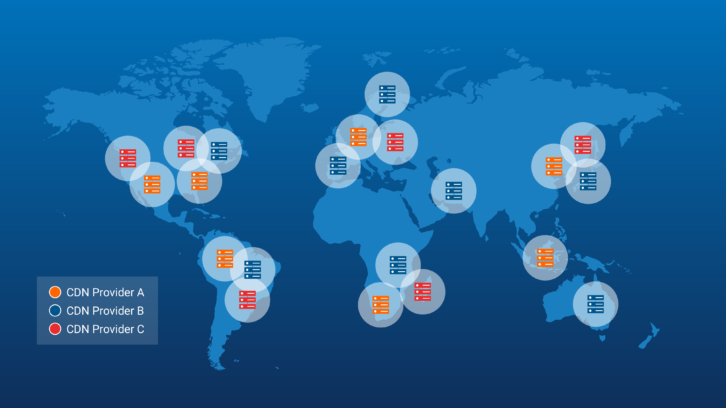 However a single CDN may not offer all of the best features for each user’s needs. Each CDN may have strengths in a specific geographic area, or there can be performance differences based on location of the end user, time of day or type of content. 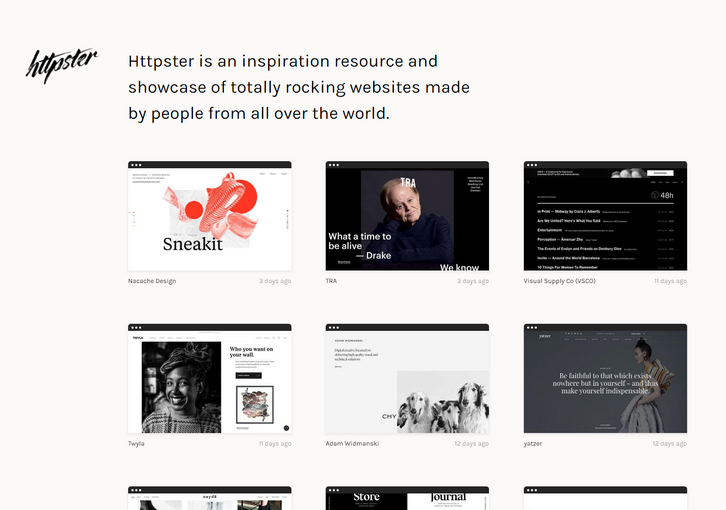 Httpster is a showcase of damn fine website design, lovingly curated and categorised so we can perv on it at our whim. They love good typography, and effective, unpretentious design; in short, simple ideas executed perfectly. While they aim to showcase excellent development as well, they apologise in advance for including poorly coded stuff if it just looks so damn good. Black Friday is a super time to take advantage of bargains in household items and consumer electronics. But what about bargains for web designers? As it turns out, web designers haven’t been left out of the picture. You can see from this selection of design aids, UI kits, stock photos, and WP themes. There is, in fact, something here for just about everyone. The driving force behind Black Friday is to get shoppers into the stores. It’s not much different with online stores. But web designers often benefit by looking where they haven’t looked before. Especially when bargains on high-quality products are the rule, as is the case with these Black Friday specials. ThemeFuse has a selection of over 30 high-quality WordPress themes to choose from. On Black Friday only, any of these themes can be yours at a 40% discount. These themes are exactly what designers and developers look for when they are called upon to create original websites for their clients; and called upon to do so on short notice. These themes cover all the common website types, including presentation websites, blogs, e-commerce websites, and portfolios. Theme topics range from business, children, and automotive, to travel, food, health & beauty and everything in between. Their flagship theme is called The Core, a multi-purpose WP theme that comes with more than 20 demos already created that can be imported with 1 click. You can test drive any of these WP themes before you purchase. This includes the Black Friday discounts. Just be sure to make the purchases you want before the deadline has passed. You’ll like what you see in the original and creative theme designs, and you’ll appreciate how easy they are to use. Millions of stock photos and videos at a 50% discount may be difficult to imagine, but that is what Dreamstime is offering on Black Friday, and through Cyber Monday. Dreamstime’s inventory is highly organized. The Smart Advanced Search system guarantees that it won’t take you any time at all to drill down to your favorite subcategories and topics, and pick out a few choice images at a bargain price. You have 20,000 RF images that you can download for free along the way. Dreamstime draws upon professional contributors who add thousands of fresh files every day. Once you’ve sampled what this stock photo resource offers, you’ll be tempted to become a regular customer. You can be assured that quality will never be an issue, since Dreamstime has been a media provider to 95% of the Fortune 500 companies. Proto.io is regarded throughout the web design community as an industry-leading prototyping platform for designers representing all experience levels. Black Friday through December 2 has been set aside as an opportunity for you to purchase an annual subscription to this premium design tool at a 30% discount. The promo code is BLACKFRIDAY2016. This Black Friday special is available to both new and existing customers. Design teams and freelancers alike work with Proto.io to enhance the workflows of their design processes from the wireframe and mockup phases through to user testing their high-fidelity, interactive prototypes. Proto.io is extremely easy to use. No coding skills or special technical skills are required on your part. Here is your chance to purchase a premium design tool at a special Black Friday price. Start with a free trial and then upgrade using their promo code until December 2. Web designers have for a long time looked upon Visual Hierarchy as a source for purchasing high quality design tools. On Black Friday, you can join many of these same designers in choosing VH’s top selling products and other useful items at up to 60% off the regular price! VH is also a marketplace where web designers and developers can sell their own products, so you are always assured of finding items that are not found anywhere else. Black Friday is your chance to purchase anything from UI Kits to fonts and mockups at bargain prices. Webflow is offering its fully responsive, CMS-ready website templates, at a 50% discount on Black Friday only. All you have to do is to use the discount code BLACKFRIDAY at the checkout. You’ll find a host of website topics to choose from among the more than 100 Webflow templates, including templates for blogs and portfolios. Each of these templates also features pre-built, dynamic CMS collections, or you can add your own structures. 50% off on quality items like these is always a bargain. Themify is celebrating Black Friday through Cyber Monday in a big way. Promo code BLACKFRIDAY opens the door to a 50% discount on all Club memberships, WordPress themes, and plugins. There will also be a drawing in which 10 Master Club memberships will be given away for free. Although the 50% discount does not apply, if you elect to join the Lifetime Master Club, with all its benefits, you can do so for only $249; a savings of $150. Use promo code BLACKFRIDAYLIFE to take advantage of this special offer. Yep, these are some great deals! There are Black Friday bargains here for new and old customers alike. This is an excellent chance for you to buy high-quality stock photos or other media items at half price. Or quality WordPress themes or website theme templates at large discounts. If any of the businesses offering these promotions are new to you, give them a closer look. You might just decide to opt for something newer and better that what you’re using now; and at a bargain price. A team leader’s role is to take a group of people who have diverse yet complementary skills, and variable degrees of experience, and mold them into a cohesive team. And make them work together toward a common objective. These same skills that can do so much when given proper direction can just as easily undermine the chances of a project’s success. If that direction is not there. A good choice of project management and collaboration tools can play an important, and even a key role. The right tools can make workflow proceed smoothly. Make the design process as a whole more transparent, and encourage collaboration among team members. Freelancers can also benefit by having the right project or task management tools on hand. Even the best tools can’t do everything. Team leaders need to get their teams working together with a common purpose in mind. Following these guidelines will help make that happen. 1) Constantly clarify team member roles. A lack of clarity or overlapping roles can only lead to confusion, oversights, and a duplication of effort. 2) Explicitly state responsibilities. Making the entire team, or even a small group, responsible for an action seldom works. Define and assign responsibilities at the individual level. 3) Identify who handles each decision. This can be done at an individual or on a group basis. In the latter case, how a decision is to be reached must be made clear. 4) Constantly review team and project goals. Doing so ensures everyone will stay focused. 5) Assign specific tools for specific functions. Don’t mix them up. The following tools were selected because they will meet almost any team’s or individual’s specific need or needs. Sharing ideas without interrupting your workflow should not be complicated. This is where Wake shines. An example: Capture ideas or information in your notebook or on your whiteboard with Wake’s iPhone app, and share it with others. Instantly. The iPhone app also allows you to stay up-to-date on project happenings when you’re away from the office or on the go. You can also upload and share screenshots, sketches, etc., without having to interrupt or leave your Illustrator, Sketch, or Photoshop session. If you want to share animations or videos of your prototypes – it’s no problem. Wake makes the design process more transparent for all parties concerned. You can share information publicly, or share it privately to a selected few. You can use Wake to show everyone what everyone is working on. Sign up for a free 30-day trial and see if Wake is the right solution for you or for your team. Several plans are available, ranging from a $22/month starter plan, to a Pro Custom plan for heavy users. InVision’s prototyping, collaboration, and workflow capabilities are integrated within a single platform. This design-driven project management platform makes it possible for design teams and freelancers alike to prototype, share, review and modify, and user test their mobile and web products. With InVision, you can upload a design file, and add animations, gestures, and transformations to create a high-fidelity, interactive prototype within 5 minutes. InVision also simplifies your feedback process by allowing team members and stakeholders to seamlessly comment on your designs in real time. You can manage project screens and statuses from a single location, and notify team members when changes in status have occurred.